A durometer gauge measures the depth of surface deformation of a pin of predetermined shape and hardness, when pushed against a surface. It is It is obvious that the depth of the deformation is directly related to the force required, so our durometer is really a stiffness indicator. Unfortunately, rubber of any type does not react to our durometer in a linear fashion, so determining the stiffness of our material requires a gauge that is properly calibrated for this application. 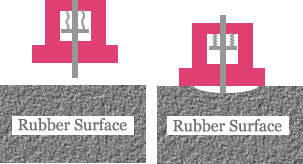 This figure shows a durometer being lowered onto a rubber surface. As the gauge is lowered, the plunger is pushed upward, and compresses the specially selected springs of known stiffness.